Astigmatism is a common vision condition that happens when a person's cornea is not symmetrical. A normal cornea is round like a baseball. With astigmatism, the cornea curves more severely, like a rugby ball. 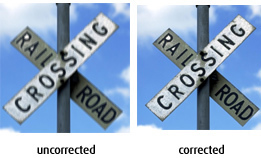 Astigmatism can come in combination with shortsightedness and longsightedness. Because of its asymmetrical curvature, the astigmatic eye focuses light correctly along one axis, but incorrectly along the other. Light entering the eye is not focused on a single point on the retina, so objects both near and far become blurred or distorted producing an effect similar to looking through a pane of wavy glass. Astigmatic Keratotomy: Performed through LASIK laser technology (photorefractive keratotomy) or through manual incisions (radial keratotomy), this procedure reshapes the cornea by removing small pieces of tissue from the cornea.